Difference between Border Collie and Australian Shepard are few and far between. Both of these breeds being bred for the purposes of herding livestock, and to be a general ‘working farm dog’ breed. Highly intelligent and super-charged with energy, these two breeds are the ideal candidates for training and competitive dog events, S a constructive way to channel and focus their abundance of energy and intelligence. The Border Collie and the Australian Shepard both make excellent competitors and partners for all forms of canine sports, including: obedience, fly ball, tracking, agility and flying disk competitions. Let’s now get into more specifics about each breed and the differences between the two. Human interactions with this breed of dog stretch all the way back to the days of old Britain. On the border between England and Scotland, these herding dogs became one of man’s greatest assets. 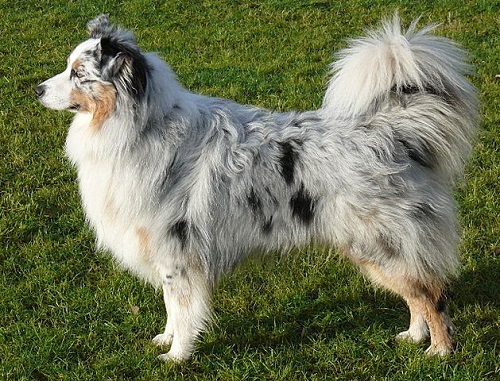 Each breed of Collie specially bred for the specific types of terrain and the work required. 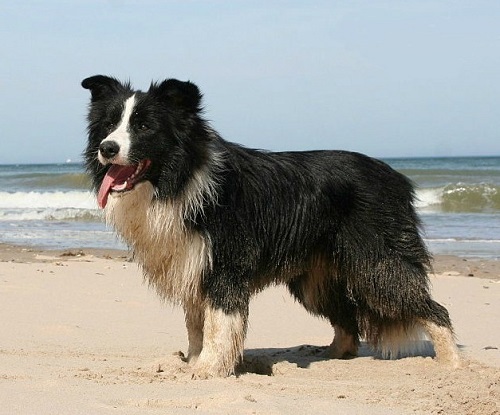 The breeds name, Border Collie, reflects the breeds particular Scottish heritage – the name Collie used to refer to the sheepdogs, and is derived from the Scottish dialect. Today, the Border Collie is recognized for its superior herding ability and has further been awarded with the accolade of being the premier sheep-herding dog. The male Border Collie, when fully grown, can reach a standing height of between 19 and 22 inches tall (48 to 55 cm), and can generally weight between 30 and 40 pounds (13 to 18 kg’s). Female Border Collie’s are much the same size and weight as much as the males, standing between 18 and 21 inches (45 to 53 cm), while they tend to carry the same general weight of anything between 30 and 40 pounds. Being the bundles of energy that they are, Border Collies are a breed that likes to be kept busy. Alert, energetic, smart and hardworking, this breed can easily become bored and can lead them to some annoying and destructive behaviors, such as: barking, digging and chasing cars. Collies are highly energetic dogs and thrive on activity. They are exceptionally alert to their handlers every cue, even the most subtle of indications. Being a strong-minded and independent breed, their compulsion to herd can lead them to herding children, cars and even other pets. If not properly socialized as a puppy, Border Collies can become fearful and express a shyer side of their personalities. Plenty of exposure to places, peoples and new things will ensure a confident and social Border Collie. Border Collies have two varieties of coats, both being double coats: a rough coat and a smooth coat. The coarser coat being the outer coat. The coat is majority black, with a white blaze running along the face, neck, back, legs, feet and tail, and can present itself with a tan coloration. It’s not however uncommon to find them sporting any bicolour, tricolor, Merle, or other solid color other than white. Excess grooming is not necessary with the Border Collie, a weekly brushing should be more than enough to keep the coats natural oils well dispersed. Bathing is only necessary every four months or so, or when they are really dirty or smelling bad. Tooth Brushing: two or three times a week will help to remove excess tartar buildup and remove unwanted bacteria from the mouth. Nail Trimming: once a month if necessary. Ears should also be checked for redness, funny odors, dirt and other signs of infection. Do not forget to check around the paws, eyes, nose and mouth for any ticks, foxtails or signs of infection. If raised properly and given the correct and proper training when young, Border Collies make excellent family dogs. This is important as their natural instinct is to herd, and this may lead them to bark, chase and nip children, and possibly other pets, as they follow their natural instincts, doing what they were bred to do. In the same vain, children should be taught how to properly approach and touch dogs, preventing any tail and ear pulling that may lead to a troublesome bite. Originally developed and bred for the western US cattle ranchers, the Australian Shepard is still used for this purpose by modern-day Aussies today. Their ancestral line includes that of the Collie and Shepard-type dogs, imported with shipments of sheep from Australia during the 1840’s. The breed enjoyed a boom in popularity during the post-World War II era, creating a hard-working, intelligent and versatile dog. Today, the Australian Shepard remains the energetic, loyal, family companion and herding dog that loves firm and confident command and direction. Longer than they are tall, the Australian Shepard male stands anywhere between 20 and 23 inches (50 to 58 cm) tall at the shoulder, while the female stands 18 to 21 inches (45 to 53 cm) at the shoulder. Males, on average, weigh in between 50 and 65 pounds (22 to 29 kg) while the females can weigh between 40 and 55 pounds (18 and 24 kg). This breed has been bred to be a functional and hard-working dog, capable of herding tough livestock in rough terrain for miles, and has no smaller size breed variations. Australian Shepard are not the best choice for a timid or first-time dog owner. They have been bred to be pushy livestock herders, and will take the dominant role in the home if not given firm and confident instruction and leadership. Their loyalty to their family and owner makes them extremely loyal, yet very standoffish to strangers. Early socialization, including different people, places, sounds, experiences and general socialization is best done while still young. Kindergarten classes are great for the socialization of puppies, while regular social activities will help to polish and round-off those social skills. Merle’s tend to becomes darker as the dog ages. Coat Brushing: should be done weekly due to the Australian Shepard’s malting habits. This will also prevent matting and help to keep their coats naturally maintained. Bathing – should only be done when the dog is really dirty or smells really bad. Bathing should not be done more than a few times a year. Grooming – is a great time to check overall condition. Check for rashes, sores, inflammation or dry skin. Also, have a look for foxtails and any other foreign objects or discharge from the ears and eyes. Nail Trimming – should be done regularly to prevent painful splintering. Nails clicking in the floor are a sign that they are too long. Being a herding dog, Australian Shepherd’s may see children and other pets as part of their flock, and will want to herd them. Chasing and nipping children is something that they will need to be taught not to do. Once they learn this lesson, they make one of the best family companions. You will have to keep an eye on your Australian Shepard whilst around kids and other pets until they learn that they are not part of their flock. Teaching children the right wat to approach and touch a dog is another important step in the socialization process. Similarly, kids should be taught not to touch a dog’s food while they are eating. As you can see these two breeds of dogs have very much in common. Both specifically breed to do a certain job, these two breeds have become the epitome of what a working farm dog should be. Perfect companions for the family with their protective natures, the Border Collie and the Australian Shepard are in a class of their own. With the right training and socialization, these dogs are the ideal family protectors and companions. Graeme Kidd. "Difference between Border Collie and Australian Shepherd." DifferenceBetween.net. July 18, 2017 < http://www.differencebetween.net/science/nature/animals-nature/difference-between-border-collie-and-australian-shepherd/ >. We have a Border Collie and he is a wonderful dog. Thank you for all the good information. Nny daughter purchased a border collie Australian shepherd for me a few weeks ago. We weren’t given much info on Cooper but I’m guessing that he is around 8 mos old. He gets along with my other dogs but is constantly pawing, nipping and at times even obsessed with my little 16 year old chihuahua. What do I do to teach him that this behavior is not ok?? PLEASE HELP!!!!! Australian Sheppards definitely have a size variety. My Blue Merle Aussie is the cutest and most loving dog. he has a pit bull and a Rat terrier chihuahua mix in his pack but they all get along great! He likes to play with the cats too.